Baaba Maal’s Television – tuned in? If you’re reading this post asking yourself who’s Baaba Maal, this is going to be one of your best days in a long time, because we’re about to open your world to an artist that has been dazzling audiences in Senegal for more than 20 years. His latest release, ‘Television‘, is his 11th album in this distinguished career. Baaba Maal was born in the town of Podor, in the Nigerian region of Senegal. He sings in Pulaar, the language of the Fila ethnic group that, as well as Senegal, can also be found in Benin, Guinea, Niger and Somalia. While the Cora is the traditional instrument for musicians of West Africa (most recently elaborated by the gifted Toumana Diabate), Baaba Maal broke whit tradition and took up playing the guitar. In part his education at the Beaux Arts in Paris has been responsible for exposing Baaba Maal to Western music and composition, but its also because he is a phenomenally gifted musician that has always sought collaborations and ideas to cross-pollinate his music – after returning from Paris Baaba Maal studied with Mansour Seck, who exposed him to traditional composition, while his 1994 release ‘Firin in Fouta’ brought together ragga, salsa and the Breton harp! 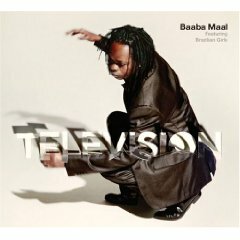 To his latest album now, and if it weren’t Baaba Maal’s unmistakable voice, you’d have great difficulty placing the title track ‘Television’ anywhere at all in Africa because it’s so devoid of African instrumentation. In fact, a consistent theme in this album is its lack of traditional instrumentation. However, due to Baaba Maal’s musical heritage and experience he pulls this off in an amazing way. This album is an expression of what the music of Senegal could sound like if there was more focus on electronic, instead of traditional instruments. Those seeking the comfort of more traditional sounds will find it in “Tino Quando”, the last track on the album that features a beautiful and simple guitar melody and vocals from Baaba Maal accompanied by backing singers in Italian. Expect to see a few DJ’s remixing this album as it’s ripe for it. For more information and purchase options, click here. I hope you take inspiration and feel positivity from the groups featured here - many living historians protecting their own culture through music. Although language and culture seperates us, politics and spin divides us, with music we can make sense of our past and help to shape a better future.